In the week when the Chairman of the Government’s own Watchdog on Standards in Public Life has warned of the approaching ‘tipping point’ of abuse being meted out to politicians and candidates, it seems that local politics is not immune to this particularly cowardly scourge of modern life. The Chairman of the SiPL Committee said this week that the wave of intimidation and abuse directed at parliamentary candidates has taken British politics to a “tipping point”, and risks driving politicians out of public life in the future. This morning, New Romney Town Council Independent candidate in tomorrow’s election – David Wimble of this Parish – received an anonymous and particularly abusive note through his door. 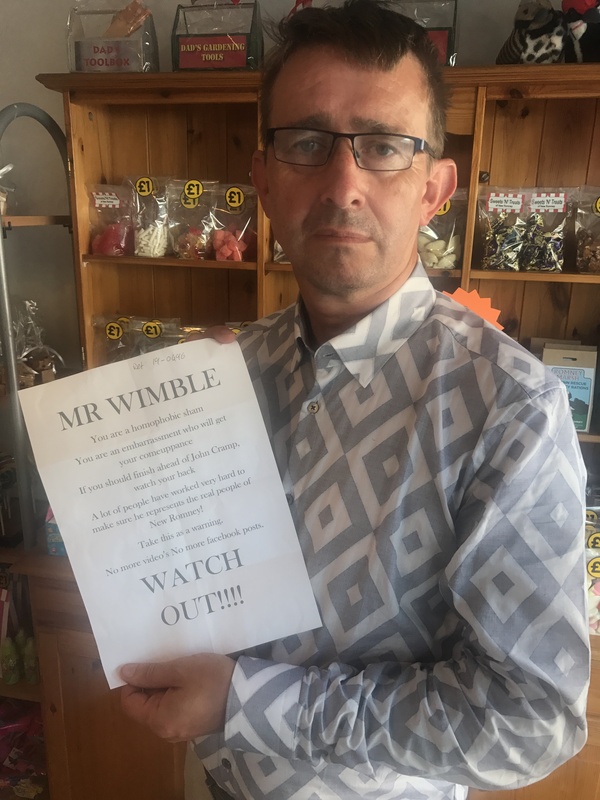 As the matter has now been taken up by the police, I wouldn’t wish to reveal the depths to which the writer has sunk, but Mr Wimble has been warned to “watch out” should he gain more votes than his Labour rival for the Town Council seat. Regular readers of The Looker will know David’s and my own political views can be divergent at times, but on this all sensible politicians must agree – at local and national level – that we must not succumb to this sort of intolerance, ignorance and plain stupidity. The future of politics must not be in the hands of idiots who think it is big and clever to issue anonymous and cowardly threats to people who are trying to do their best for their community, regardless of the colour they nail to their particular political mast. We should allow the natural course of political debate to take its true course and not be waivered by a minority of people who just don’t know how to behave properly. It is important for everyone eligible to vote tomorrow to vote for the person who they think will do the best job for the town, irrespective of how a thuggish element may try to influence the outcome. While many people would say that the state of local politics isn’t in the best shape, it can only be influenced by those who are elected to serve their communities, and therefore vital that everyone makes the effort to put an ‘X’ next to their candidate of choice on Thursday (20th).